Finally, here is the completed product with the new tile grout color. Notice the black grouting inside the garden clay pot. The inside grout is only 3 to 4 inches deep. The rest of the inside of the pot (up to the bottom) is untreated. For a better appreciation of the finished product, here's a video showing the mosaic design of the garden pot. With the success of the first Garden Clay Pot with the Mosaic Tiles for my son's school project, I decided to make my own. My son's project was essentially a simple horizontal layer design with a Mexican color theme. 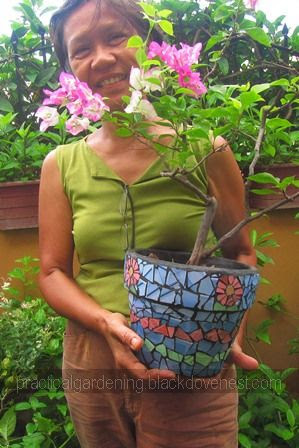 The second garden clay pot project used a four-flower theme. The flowers' petals are pink tiles. The center of the flower is a beige-colored tile piece. Two green tile pieces at the bottom of the flower comprise the leaves. 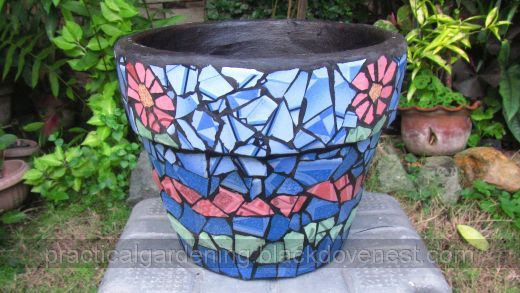 Here is the video showing the flower mosaic design of the second garden pot. This is a bigger garden pot and so the drain hole is at the side rather than the bottom. The drain hole is positioned about half-inch from the bottom. Because of the tile pieces' position, it is shaped like a diamond and colored black because of the grout coating along its sides. In the first frame of the video, you'll notice the drain hole was left open. Although the dominant color in this pot is blue, the lower part has a deeper shade of blue. The top part has a lighter blue "sky" color. The surface of the top blue tiles is glass-like and shimmers as the pot is turned. Finally, here are the two finished pots as used. 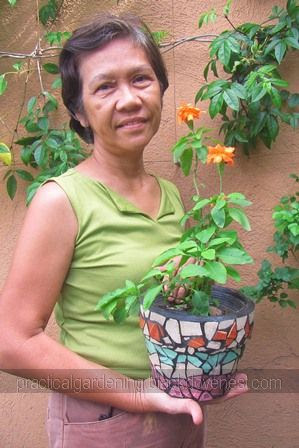 The pot at the left has an orange flowering Crossandra, while the one at the right has a flowering "splash" Bougainvillea. 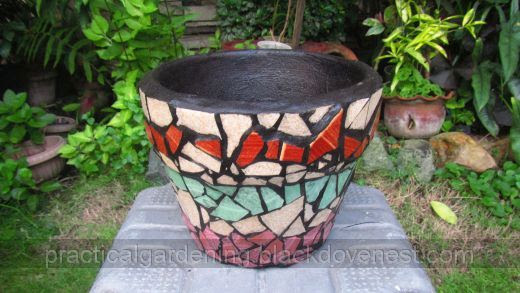 These mosaic garden clay pots may be used indoors or outdoors. Tile grout may be used up to a year only if the grout is kept dry in a sealed container. Store the grout in a dry and dark place. Be sure to label the container with the date the tile grout was last used. This will indicate if the grout is still good to use. Bag the tile pieces separately. This will be more convenient for the next time you will be working on a similar project. Clear plastic bags will allow easy identification of available tile colors. Be sure to store these in a cool dark place where they don't dry out and then harden.